So, I’m here today to do some-what of an intervention and to hopefully inspire you to try something new. You know those corn tortillas you buy for a couple bucks at the store but don’t actually like? Stop buying them. Just stop it. I could never understand the big deal about corn tortillas. Unless they were used in enchiladas, the texture seemed rubbery and the taste was a mild blah. If I was going to eat a soft-shell taco, it certainly wasn’t going to be with a corn tortilla. 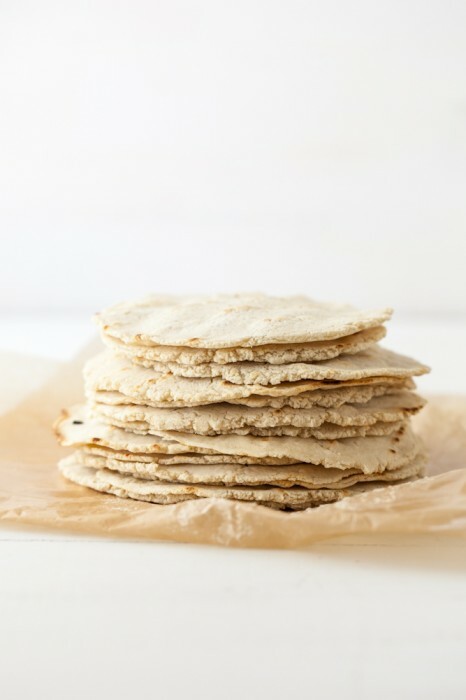 Then I made my own homemade corn tortillas and I couldn’t believe how much better they were. Yes, I know that’s what I get up on my box and shout almost every day but still, this was a huge difference. We were now talking soft, perfectly pliable tortillas with a hint of earthy corn taste. I felt like I had been duped my entire life. Here I thought I had a thing against corn tortillas when all along, it was just because they were store-bought. So, I made this short video to show you how easy it is to make homemade corn tortillas. While I use a tortilla press, making tortillas without one is easy too (it just takes a little extra arm muscle.) Corn tortillas freeze well so I’ll often whip up a double batch and freeze the tortillas. Measure out Masa into a medium bowl. Dissolve salt in the warm water. Pour warm water into masa, stirring and kneading until dough comes together. Dough should be soft but not sticky. I typically use around 1 1/3 cup of water. Cover and set aside for at least a half hour. After dough has rested, take golf-ball size portions out. Place between two pieces of parchment paper, and flatten out with tortillas press. Cook for 2-3 minutes on each side. Cover done tortillas with a damp towel. *video was shot, cooked, and edited by me with a cameo in one scene by my dog, sometimes that’s life. Big love for that video tutorial and the music selection. Was so homey and nice to watch. Can we make tortillas together in the same kitchen some day? I’d like that. Thanks for this! I have a press, but never thought to use parchment paper on it so my tortillas end up too thick or too thin, and stuck to the press. Thanks for the tip! 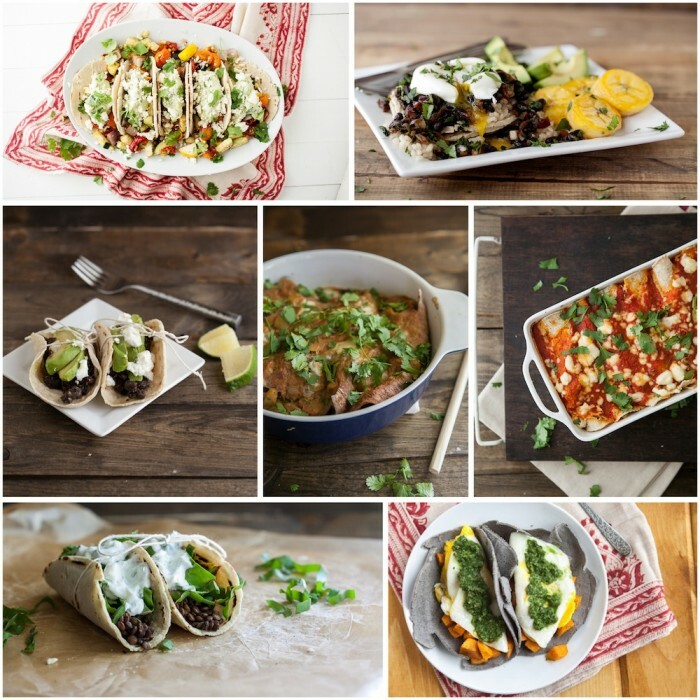 Corn tortillas are super easy! This makes me miss my old tortilla press (we had to get rid of it, along with half the apartment, when we moved to NYC several years ago–boo). Ok, I’m a little embarrassed to admit this, but I have never made tortillas from scratch (even though we eat all forms of tacos probably multiple times a month). You make it look so easy! I love your video! and I love that song in your video! Such a lovely video…I’m craving all kinds of tacos now! What a wonderful video! I just stole (er, borrowed) my mom’s tortilla press, and this gives me the extra push to go ahead and USE it already! I always love your videos! So well done, and I get a great sense of how you work! lovely job! These are perfect! I recently had to go gluten-free, and I can’t find corn tortillas anywhere near me. I can definitely make these, yet I was expecting them to be much more finicky. I was wondering, how do you keep your leftover tortillas fresh? Refrigeration? Yes- or you can also freeze them. I really want to try this – I wanted to let you know that I featured this on my “What I Bookmarked This Week” post – stop by and see! It’s so true – I don’t know why I keep buying those corn tortillas from the store – I don’t really like them at all. I also didn’t have any idea how easy it was to make them myself (OR that they freeze)! Thanks, Erin! And if you are looking for more corn tortilla variations, I meant to recommend an Indian recipe called “makki ki rotti.” It’s essentially a corn tortilla made with grated radish and a few spices or other add-ins; here’s a quick link to one ( http://chefinyou.com/2010/02/makki-roti-recipe/ …mine come out softer-looking than this photo though). That’s what I had originally brought the press to make, and I love them. I put diced red onion, cumin seeds, and chopped cilantro in my dough, and eat them for breakfast with a scoop of greek yogurt and a hard-boiled egg. I think you’d like it! I add a small amount (20g) of blue corn meal to the Masa. It makes the texture more interesting and more flavourful. I sometimes add less (10-12g) of flax meal to make them a bit healthier…but I do not like these quite as much as the blue corn meal ones. So good! Made some with homemade salsa and enchilada sauce…turned it great! The kind of corn flour used is important… the one Ella suggests is VERY good! I’m planning a Mexican Themed bachelorette at the end of the month – this will be perfect! Can I make this recipe using cornmeal instead of masa? What kind of pan are you using in the video?? It looks nice and definitely mess free! Hi Whitney, Are you asking about the tortillas press or the panini press? The tortillas press is just that and the pan is a panini kit I believe from Calphalon. Hope that helps! I’ve just began making corn tortillas, I am interested in learning how to add different flavors such as black bean, garlic, etc. Like the Tostitos that are so expensive in the grocery stores. You’ve convinced me. If you can’t get decent store bought corn tortillas in America can you imagine what they are like in Australia. This will be my project for the winter I’ll buy a chapati press and order some masa harina online and make my own corn tortillas. I can’t wait to try out this recipe!! Do you have to eat these the night you make them, or do they also store well? Thanks!! Nope- I’ll often make a double batch and freeze a few for later use. Then, i just reheat them in a damp towel! Hi I can you freeze them before cooking them? We always deep fried them before making into enchiladas, I am making them from scratch for the first time. was not sure if I should cook then fry or or just fry them. I moved to Quebec Canada cant find a corn tortilla anywhere. Thank you cant wait to try your recipe. I’ve actually never tried freezing before cooking. Typically I would cook, freeze, then cook again before using. They are so delicate before cooking I’m not sure they would hold together well. Thank your for the response. making them this morning. so excited. miss my new mexico foods. love your website!!! !